"E.T." redirects here. For other uses, see ET. The concept was based on an imaginary friend Spielberg created after his parents' divorce in 1960. In 1980, Spielberg met Mathison and developed a new story from the stalled sci-fi horror film project Night Skies. It was filmed from September to December 1981 in California on a budget of $10.5 million USD. Unlike most films, it was shot in rough chronological order, to facilitate convincing emotional performances from the young cast. Released on June 12, 1982, by Universal Pictures, E.T. was an immediate blockbuster, surpassing Star Wars to become the highest-grossing film of all time—a record it held for eleven years until Jurassic Park, another Spielberg-directed film, surpassed it in 1993. Considered one of the greatest films ever made, it was widely acclaimed by critics as a timeless story of friendship, and it ranks as the greatest science fiction film ever made in a Rotten Tomatoes survey. In 1994, it was selected for preservation in the United States National Film Registry as being "culturally, historically, or aesthetically significant". It was re-released in 1985, and then again in 2002, to celebrate its 20th anniversary, with altered shots and additional scenes. Pat Welsh as the voice of E.T. After his parents' divorce in 1960, Spielberg filled the void with an imaginary alien companion. He said that the imaginary alien was "a friend who could be the brother [he] never had and a father that [he] didn't feel [he] had anymore". During 1978, he announced he would shoot a film entitled Growing Up, which he would film in 28 days. The project was set aside because of delays on 1941, but the concept of making a small autobiographical film about childhood would stay with him. He also thought about a follow-up to Close Encounters of the Third Kind, and began to develop a darker project he had planned with John Sayles called Night Skies in which malevolent aliens terrorize a family. Filming Raiders of the Lost Ark in Tunisia left Spielberg bored, and memories of his childhood creation resurfaced. He told screenwriter Melissa Mathison about Night Skies, and developed a subplot from the failed project, in which Buddy, the only friendly alien, befriends an autistic child. His abandonment on Earth in the script's final scene inspired the E.T. concept. She wrote a first draft titled E.T. and Me in eight weeks, which he considered perfect. The script went through two more drafts, which deleted an "Eddie Haskell"–esque friend of Elliott. The chase sequence was also created, and he also suggested having the scene where E.T. got drunk. In early summer 1981, while Raiders of the Lost Ark was being promoted, Columbia Pictures met with Spielberg to discuss the script, after having to develop Night Skies with the director as the intended sequel to Close Encounters of the Third Kind. However, the head of Columbia Pictures' marketing and research development, Marvin Atonowsky, concluded that it had a limited commercial potential, believing that it would appeal to mostly young kids. The President of Columbia's worldwide productions, John Veitch, also felt that the script was not good or scary enough to draw enough crowd. On the advice of Atonowsky and Veitch, Columbia Pictures CEO Frank Price passed on the project, calling it "a wimpy Walt Disney movie" and thus putting it in a turnaround, so Spielberg approached the more receptive Sid Sheinberg, president of MCA, the then-parent company of Universal Studios. Spielberg told Sheinberg to acquire the E.T. script from Columbia Pictures, which he did for $1 million and struck a deal with Price in which Columbia would retain 5% of the film's net profits. Veitch later recalled that "I think [in 1982] we made more on that picture than we did on any of our films." Carlo Rambaldi, who designed the aliens for Close Encounters of the Third Kind, was hired to design the animatronics of E.T. Rambaldi's own painting Women of Delta led him to give the creature a unique, extendable neck. Its face was inspired by those of Carl Sandburg, Albert Einstein and Ernest Hemingway. Producer Kathleen Kennedy visited the Jules Stein Eye Institute to study real and glass eyes. She hired Institute staffers to create E.T. 's eyes, which she felt were particularly important in engaging the audience. Four heads were created for filming, one as the main animatronic and the others for facial expressions, as well as a costume. Two dwarfs, Tamara De Treaux and Pat Bilon, as well as 12-year-old Matthew DeMeritt, who was born without legs, took turns wearing the costume, depending on what scene was being filmed. DeMeritt actually walked on his hands and played all scenes where he walked awkwardly or fell over. The head was placed above that of the actors, and the actors could see through slits in its chest. Caprice Roth, a professional mime, filled prosthetics to play E.T. 's hands. The puppet was created in three months at the cost of $1.5 million. Spielberg declared it was "something that only a mother could love". Mars, Incorporated refused to allow M&M's to be used in the film, believing E.T. would frighten children. After Mars said "No", The Hershey Company was asked if Reese's Pieces could be used, and it agreed; this product placement resulted in a large increase in Reese's Pieces sales. Science and technology educator Henry Feinberg created E.T. 's communicator device. Having worked with Cary Guffey on Close Encounters of the Third Kind, Spielberg felt confident in working with a cast composed mostly of child actors. For the role of Elliott, he auditioned hundreds of boys before Jack Fisk suggested Henry Thomas for the role because Henry had played the part of Harry in the film Raggedy Man which Jack Fisk had directed. Thomas, who auditioned in an Indiana Jones costume, did not perform well in the formal testing, but got the filmmakers' attention in an improvised scene. Thoughts of his dead dog inspired his convincing tears. Robert MacNaughton auditioned eight times to play Michael, sometimes with boys auditioning for Elliott. Spielberg felt Drew Barrymore had the right imagination for mischievous Gertie after she impressed him with a story that she led a punk rock band. He enjoyed working with the children, and he later said that the experience made him feel ready to be a father. The major voice work of E.T. for the film was performed by Pat Welsh. She smoked two packs of cigarettes a day, which gave her voice a quality that sound effects creator Ben Burtt liked. She spent nine-and-a-half hours recording her part, and was paid $380 by Burtt for her services. He also recorded 16 other people and various animals to create E.T. 's "voice". These included Spielberg, Debra Winger, his sleeping wife, who had a cold, a burp from his USC film professor, raccoons, otters, and horses. Doctors working at the USC Medical Center were recruited to play the ones who try to save E.T. after government agents take over Elliott's house. Spielberg felt that actors in the roles, performing lines of technical medical dialogue, would come across as unnatural. During post-production, he decided to cut a scene featuring Harrison Ford as the principal at Elliott's school. It featured his character reprimanding Elliott for his behavior in biology class and warning of the dangers of underage drinking. He is then taken aback as Elliott's chair rises from the floor, while E.T. is levitating his "phone" equipment up the stairs with Gertie. The film began shooting in September 1981. The project was filmed under the cover name A Boy's Life, as Spielberg did not want anyone to discover and plagiarize the plot. The actors had to read the script behind closed doors, and everyone on set had to wear an ID card. The shoot began with two days at a high school in Culver City, and the crew spent the next 11 days moving between locations at Northridge and Tujunga. The next 42 days were spent at Culver City's Laird International Studios, for the interiors of Elliott's home. The crew shot at a redwood forest near Crescent City for the production's last six days. 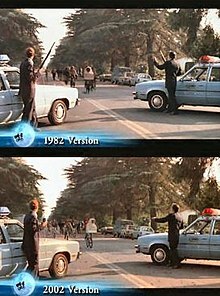 The exterior Halloween scene and the "flying bicycle" chase scenes were filmed in Porter Ranch. Spielberg shot the film in roughly chronological order to achieve convincingly emotional performances from his cast. In the scene in which Michael first encounters E.T., his appearance caused MacNaughton to jump back and knock down the shelves behind him. The chronological shoot gave the young actors an emotional experience as they bonded with E.T., making the quarantine sequences more moving. Spielberg ensured the puppeteers were kept away from the set to maintain the illusion of a real alien. For the first time in his career, he did not storyboard most of the film, in order to facilitate spontaneity in the performances. The film was shot so adults, except for Dee Wallace, are never seen from the waist up in its first half, as a tribute to Tex Avery's cartoons. The shoot was completed in 61 days, four days ahead of schedule. According to Spielberg, the memorable scene where E.T. disguises himself as a stuffed toy in Elliott's closet was suggested by colleague Robert Zemeckis, after he read a draft of the screenplay that Spielberg had sent him. Longtime Spielberg collaborator John Williams, who composed the film's musical score, described the challenge of creating one that would generate sympathy for such an odd-looking creature. As with their previous collaborations, Spielberg liked every theme Williams composed and had it included. Spielberg loved the music for the final chase so much that he edited the sequence to suit it. Williams took a modernist approach, especially with his use of polytonality, which refers to the sound of two different keys played simultaneously. The Lydian mode can also be used in a polytonal way. Williams combined polytonality and the Lydian mode to express a mystic, dreamlike and heroic quality. His theme—emphasizing coloristic instruments such as the harp, piano, celesta, and other keyboards, as well as percussion—suggests E.T. 's childlike nature and his "machine". There were allegations that the film was plagiarized from a 1967 script, The Alien, by Indian Bengali director Satyajit Ray. He stated, "E.T. would not have been possible without my script of The Alien being available throughout the United States in mimeographed copies." Spielberg denied this claim, stating, "I was a kid in high school when his script was circulating in Hollywood." Director and Spielberg's friend, Martin Scorsese, has also alleged the film was influenced by Ray's script. Star Weekend Magazine disputes Spielberg's claim, pointing out that he had graduated from high school in 1965 and began his career as a director in Hollywood in 1969. The Times of India noted that E.T. and Close Encounters of the Third Kind (1977) had "remarkable parallels" with The Alien. These parallels include the physical nature of the alien. In his screenplay, which Ray wrote entirely in English, he described the alien as "a cross between a gnome and a famished refugee child: large head, spindly limbs, a lean torso. Is it male or female or neuter? We don't know. What its form basically conveys is a kind of ethereal innocence, and it is difficult to associate either great evil or great power with it; yet a feeling of eeriness is there because of the resemblance to a sickly human child." No legal action was taken, as Ray did not want to show himself as having a "vindictive" mindset against Spielberg and acknowledged that he "has made good films and he is a good director." In 1984, a federal appeals court ruled against playwright Lisa Litchfield, who sued Steven Spielberg in a $750 million lawsuit claiming he used her one-act musical play 'Lokey from Maldemar' as the basis for the movie E.T. She lost the case, with the court panel stating "No reasonable jury could conclude that Lokey and E.T. were substantially similar in their ideas and expression." "Any similarities in plot exist only at the general level for which (Ms. Litchfield) cannot claim copyright protection." Spielberg drew the story of the film from his parents' divorce; Gary Arnold of The Washington Post called it "essentially a spiritual autobiography, a portrait of the filmmaker as a typical suburban kid set apart by an uncommonly fervent, mystical imagination". References to his childhood occur throughout: Elliott fakes illness by holding a thermometer to the bulb in his lamp while covering his face with a heating pad, a trick frequently employed by the young Spielberg. Michael picking on Elliott echoes Spielberg's teasing of his younger sisters, and Michael's evolution from tormentor to protector reflects how Spielberg had to take care of his sisters after their father left. Critics have focused on the parallels between E.T. 's life and Elliott, who is "alienated" by the loss of his father. A.O. Scott of The New York Times wrote that while E.T. "is the more obvious and desperate foundling", Elliott "suffers in his own way from the want of a home". E.T. is the first and last letter of Elliott's name. At the film's heart is the theme of growing up. Critic Henry Sheehan described the film as a retelling of Peter Pan from the perspective of a Lost Boy (Elliott): E.T. cannot survive physically on Earth, as Pan could not survive emotionally in Neverland; government scientists take the place of Neverland's pirates. Vincent Canby of The New York Times similarly observed that the film "freely recycles elements from [...] Peter Pan and The Wizard of Oz". Some critics have suggested that Spielberg's portrayal of suburbia is very dark, contrary to popular belief. According to A.O. Scott, "The suburban milieu, with its unsupervised children and unhappy parents, its broken toys and brand-name junk food, could have come out of a Raymond Carver story." Charles Taylor of Salon.com wrote, "Spielberg's movies, despite the way they're often characterized, are not Hollywood idealizations of families and the suburbs. The homes here bear what the cultural critic Karal Ann Marling called 'the marks of hard use'." Other critics found religious parallels between E.T. and Jesus. Andrew Nigels described E.T. 's story as "crucifixion by military science" and "resurrection by love and faith". According to Spielberg biographer Joseph McBride, Universal Pictures appealed directly to the Christian market, with a poster reminiscent of Michelangelo's The Creation of Adam and a logo reading "Peace". Spielberg answered that he did not intend the film to be a religious parable, joking, "If I ever went to my mother and said, 'Mom, I've made this movie that's a Christian parable,' what do you think she'd say? She has a Kosher restaurant on Pico and Doheny in Los Angeles." As a substantial body of film criticism has built up around the film, numerous writers have analyzed it in other ways as well. It has been interpreted as a modern fairy tale and in psychoanalytic terms. Producer Kathleen Kennedy noted that an important theme of E.T. is tolerance, which would be central to future Spielberg films such as Schindler's List. Having been a loner as a teenager, Spielberg described it as "a minority story". Spielberg's characteristic theme of communication is partnered with the ideal of mutual understanding: he has suggested that the story's central alien-human friendship is an analogy for how real-world adversaries can learn to overcome their differences. The film was previewed in Houston, Texas, where it received high marks from viewers. It premiered at the 1982 Cannes Film Festival's closing gala, and was released in the United States on June 11, 1982. It opened at number one with a gross of $11 million, and stayed at the top of the box office for six weeks; it then fluctuated between the first and second positions until October, before returning to the top spot for the final time in December during a brief Holiday Season re-release of the film. In 1983, E.T. surpassed Star Wars as the highest-grossing film of all-time, and by the end of its theatrical run it had grossed $359 million in North America and $619 million worldwide. Box Office Mojo estimates that the film sold more than 120 million tickets in the US in its initial theatrical run. Spielberg earned $500,000 a day from his share of the profits, while The Hershey Company's profits rose 65% due to its prominent use of Reese's Pieces. The "Official E.T. Fan Club" offered photographs, a newsletter that let readers "relive the film's unforgettable moments [and] favorite scenes", and a phonographic record with "phone home" and other sound clips. The film was re-released in 1985 and 2002, earning another $60 million and $68 million respectively, for a worldwide total of $792 million with North America accounting for $435 million. It held the global record until it was surpassed by Jurassic Park—another Spielberg-directed film—in 1993, although it managed to hold on to the domestic record for a further four years, where a Star Wars reissue reclaimed it. 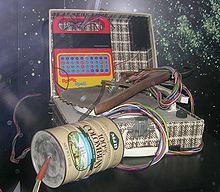 It was eventually released on VHS and laserdisc on October 27, 1988; to combat piracy, the tapeguards and tape hubs on the videocassettes were colored green, the tape itself was affixed with a small, holographic sticker of the 1963 Universal logo (much like the holograms on a credit card), and encoded with Macrovision. In North America alone, VHS sales came to $75 million. In 1991, Sears began selling E.T. videocassettes exclusively at their stores as part of a holiday promotion. It was reissued on VHS and Laserdisc again in 1996. The Laserdisc included a 90-minute documentary. Produced and directed by Laurent Bouzereau, it included interviews with Spielberg, producer Kathleen Kennedy, composer John Williams and other cast and crew members. It also included two theatrical trailers, an isolated music score, deleted scenes, and still galleries. The VHS included a 10-minute version of the same documentary from the Laserdisc. The film sold over 15 million VHS units in the United States, and grossed more than $250 million in video sales revenue. The VHS cassette was also rented over 6 million times during its first two weeks in 1988, a record that E.T. held up until the VHS release of Batman the following year. The 2012 release of E.T. on DVD and Blu-ray grossed $24.4 million in sales revenue as of 2017[update] in the United States. E.T. also generated more than $1 billion in merchandise sales, as of 1998. Empire called Elliott and E.T. 's flight to the forest "the most magical moment in cinema history". The image of them encircled by the moon is now the symbol for Spielberg's company Amblin Entertainment. This scene is a tribute to Vittorio De Sica's movie Miracle in Milan, one of Spielberg's favorite films. The film received universal acclaim. Roger Ebert gave the film four stars and wrote, "This is not simply a good movie. It is one of those movies that brush away our cautions and win our hearts." He later added it to his Great Movies list, structuring the essay as a letter to his grandchildren about the first time they watched it. Michael Sragow of Rolling Stone called Spielberg "a space age Jean Renoir.... for the first time, [he] has put his breathtaking technical skills at the service of his deepest feelings". Derek Malcolm of The Guardian wrote that "E.T. is a superlative piece of popular cinema ... a dream of childhood, brilliantly orchestrated to involve not only children but anyone able to remember being one". Leonard Maltin would include it in his list of "100 Must-See Films of the 20th Century" as one of only two movies from the 1980s. George Will was one of the few to pan the film, feeling it spread subversive notions about childhood and science. The film holds a 98% "Certified Fresh" approval rating on Rotten Tomatoes, based on 125 reviews, and an average rating of 9.22/10. The website's critical consensus reads: "Playing as both an exciting sci-fi adventure and a remarkable portrait of childhood, Steven Spielberg's touching tale of a homesick alien remains a piece of movie magic for young and old." On Metacritic, it has a weighted average score of 91/100, based on 30 reviews, indicating "universal acclaim". In addition to the many impressed critics, President Ronald Reagan and First Lady Nancy Reagan were moved by it after a screening at the White House on June 27, 1982. Princess Diana was in tears after watching it. On September 17, 1982, it was screened at the United Nations, and Spielberg received a UN Peace Medal. CinemaScore reported that audiences gave the film a rare "A+" grade, the first known film to earn that grade. The film was nominated for nine Oscars at the 55th Academy Awards, including Best Picture. Gandhi won that award, but its director, Richard Attenborough, declared, "I was certain that not only would E.T. win, but that it should win. It was inventive, powerful, [and] wonderful. I make more mundane movies." It won four Academy Awards: Best Original Score, Best Sound (Robert Knudson, Robert Glass, Don Digirolamo and Gene Cantamessa), Best Sound Effects Editing (Charles L. Campbell and Ben Burtt), and Best Visual Effects (Carlo Rambaldi, Dennis Muren and Kenneth F. Smith). At the 40th Golden Globe Awards, the film won Best Picture in the Drama category and Best Score; it was also nominated for Best Director, Best Screenplay, and Best New Male Star for Henry Thomas. The Los Angeles Film Critics Association awarded the film Best Picture, Best Director, and a "New Generation Award" for Melissa Mathison. The film won Saturn Awards for Best Science Fiction Film, Best Writing, Best Special Effects, Best Music, and Best Poster Art, while Henry Thomas, Robert McNaughton, and Drew Barrymore won Young Artist Awards. In addition to his Golden Globe and Saturn, composer John Williams won two Grammy Awards and a BAFTA for the score. It was also honored abroad: it won the Best Foreign Language Film award at the Blue Ribbon Awards in Japan, Cinema Writers Circle Awards in Spain, César Awards in France, and David di Donatello in Italy. In American Film Institute polls, the film has been voted the 24th greatest film of all time, the 44th most heart-pounding, and the sixth most inspiring. Other AFI polls rated it as having the 14th greatest music score and as the third greatest science-fiction one. The line "E.T. phone home" was ranked 15th on AFI's 100 Years...100 Movie Quotes list, and 48th on Premiere's top movie quote list. In 2005, it topped a Channel 4 poll of the 100 greatest family films, and was also listed by Time as one of the 100 best movies ever made. In 2003, Entertainment Weekly called the film the eighth most "tear-jerking"; in 2007, in a survey of both films and television series, the magazine declared it the seventh greatest work of science-fiction media in the past 25 years. The Times also named it as their ninth favorite alien in a film, calling it "one of the best-loved non-humans in popular culture". It is among the top ten in the BFI list of the 50 films you should see by the age of 14. In 1994, it was selected for preservation in the U.S. National Film Registry as being "culturally, historically, or aesthetically significant". In 2011, ABC aired Best in Film: The Greatest Movies of Our Time, revealing the results of a poll of fans conducted by ABC and People magazine: it was selected as the fifth best film of all time and the second best science fiction film. On October 22, 2012, Madame Tussauds unveiled wax likenesses of E.T. at six of its international locations. An extended version of the film, dubbed the "Special Edition"––currently out of circulation, including altered visual effects, premiered at the Shrine Auditorium in Los Angeles on March 16, 2002; it was released on home media six days later. Certain shots of E.T. had bothered Spielberg since 1982, as he did not have enough time to perfect the animatronics. Computer-generated imagery (CGI), provided by Industrial Light & Magic (ILM), was used to modify several shots, including ones of E.T. running in the opening sequence and being spotted in the cornfield. The spaceship's design was also altered to include more lights. Scenes shot for but not included in the original version were introduced. These included E.T. taking a bath, and Gertie telling Mary that Elliott went to the forest on Halloween. Spielberg did not add the scene featuring Harrison Ford, feeling that would reshape the film too drastically. He became more sensitive about the scene where gun-wielding federal agents confront Elliott and his escaping friends and had them digitally replaced with walkie-talkies. At the premiere, John Williams conducted a live performance of the score. The new release grossed $68 million in total, with $35 million coming from Canada and the United States. The changes to it, particularly the escape scene, were criticized as political correctness. Peter Travers of Rolling Stone wondered, "Remember those guns the feds carried? Thanks to the miracle of digital, they're now brandishing walkie-talkies.... Is this what two decades have done to free speech?" Chris Hewitt of Empire wrote, "The changes are surprisingly low-key...while ILM's CGI E.T. is used sparingly as a complement to Carlo Rambaldi's extraordinary puppet." South Park ridiculed many of the changes in the 2002 episode "Free Hat". The two-disc DVD release which followed in October 22, 2002, contained the original theatrical and 20th Anniversary extended versions of the film. Spielberg personally demanded the release feature both versions. The features on disc one included an introduction with Steven Spielberg, a 20th Anniversary premiere featurette, John Williams' performance at the 2002 premiere and a Space Exploration game. Disc two included a 24-minute documentary about the 20th Anniversary edition changes, a "Reunion" featurette, a trailer, cast and filmmaker bios, production notes, and the still galleries ported from the 1996 LaserDisc set. The two-disc edition, as well as a three-disc collector's edition containing a "making of" book, a certificate of authenticity, a film cell, and special features that were unavailable on the two-disc edition, were placed in moratorium on December 31, 2002. Later, it was re-released on DVD as a single-disc re-issue in 2005, featuring only the 20th Anniversary version. [In the future,] ... There's going to be no more digital enhancements or digital additions to anything based on any film I direct.... When people ask me which E.T. they should look at, I always tell them to look at the original 1982 E.T. If you notice, when we did put out E.T. we put out two E.T.s. We put out the digitally enhanced version with the additional scenes and for no extra money, in the same package, we put out the original '82 version. I always tell people to go back to the '82 version. For the film's 30th anniversary release on Blu-ray in 2012, and for its 35th anniversary release on Ultra HD Blu-ray in 2017, as well as its corresponding digital releases, only the original theatrical edition was released, with the 20th anniversary edition now out of circulation. Atari, Inc. made a video game based on the film for the Atari 2600. Released in 1982, it was widely considered to be one of the worst video games ever made. 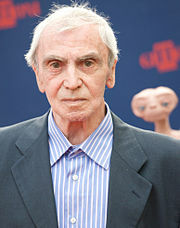 William Kotzwinkle, author of the film's novelization, wrote a sequel, E.T. : The Book of the Green Planet, which was published in 1985. In the novel, E.T. returns home to the planet Brodo Asogi, but is subsequently demoted and sent into exile. He then attempts to return to Earth by effectively breaking all of Brodo Asogi's laws. E.T. Adventure, a theme park ride, debuted at Universal Studios Florida in June 7, 1990. The $40 million attraction features the title character saying goodbye to visitors by name. In 1998, E.T. was licensed to appear in television public service announcements produced by the Progressive Corporation. The announcements featured his voice reminding drivers to "buckle up" their seat belts. Traffic signs depicting a stylized E.T. wearing one were installed on selected roads around the United States. The following year, British Telecommunications launched the "Stay in Touch" campaign, with him as the star of various advertisements. The campaign's slogan was "B.T. has E.T. ", with "E.T." also taken to mean "extra technology". At Spielberg's suggestion, George Lucas included members of E.T. 's species as background characters in Star Wars: Episode I – The Phantom Menace. E.T. was one of the franchises featured in the 2016 crossover games Lego Dimensions. E.T. appears as one of the playable characters, and a world based on the movie where players can receive side quests from the characters is available. 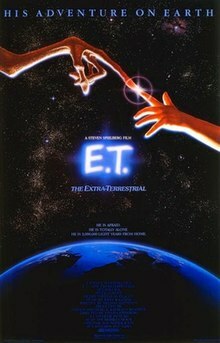 In July 1982, during the film's first theatrical run, Spielberg and Mathison wrote a treatment for a sequel to be titled E.T. II: Nocturnal Fears. It would have shown Elliott and his friends getting kidnapped by evil aliens and follow their attempts to contact E.T. for help. Spielberg decided against pursuing it, feeling it "would do nothing but rob the original of its virginity". ^ Stewart, Jocelyn (February 10, 2008). "Artist created many famous film posters". Los Angeles Times. Archived from the original on June 11, 2013. Retrieved April 17, 2010. ^ "E.T. the Extra Terrestrial (U)". British Board of Film Classification. July 30, 1982. Archived from the original on January 11, 2017. Retrieved September 16, 2016. ^ a b c d "E.T. : The Extra-Terrestrial". Box Office Mojo. Archived from the original on January 24, 2014. Retrieved February 5, 2009. ^ "Vertigo - Hollywood's 100 Favorite Films". ^ a b c d e f g Brode, Douglas (1995). "E.T. the Extra-Terrestrial". The Films of Steven Spielberg. Citadel. pp. 114–127. ISBN 0-8065-1540-6. ^ a b c d e f g h McBride, Joseph (1997). Steven Spielberg. Faber and Faber. pp. 323–38. ISBN 0-571-19177-0. ^ a b c d e f g h i j k E.T. the Extra-Terrestrial: The 20th Anniversary Celebration (DVD). Universal, directed by Laurent Bouzereau. 2002. ^ a b c McBride, Joseph (January 4, 2011). Steven Spielberg: A Biography, Second Edition. University Press of Mississippi. pp. 323–38. ISBN 1-604-73836-7. ^ Caulfield, Deborah (May 23, 1983). "E.T. Gossip: The One That Got Away?". Los Angeles Times. ^ a b c d e Daly, Steve (March 22, 2002). "Starry Role". Entertainment Weekly. Archived from the original on September 24, 2010. Retrieved April 17, 2010. ^ Paul M. Sammon (January 11, 1983). "Turn on Your Heartlight – Inside E.T." Cinefex. Archived from the original on January 17, 2008. ^ "Creating A Creature". Time. May 31, 1982. Archived from the original on August 23, 2007. Retrieved April 18, 2007. ^ a b David van Biema (July 26, 1983). "Life is Sweet for Jack Dowd as Spielberg's Hit Film Has E.T. Lovers Picking up the (Reeses's) Pieces". People. ^ "Biography". QRZ.com. Archived from the original on February 1, 2014. Retrieved May 19, 2012. ^ Pierce, Tony (November 3, 2014). "How Steven Spielberg chose Henry Thomas to play Elliott in E.T." Archived from the original on December 23, 2015. Retrieved December 22, 2015. ^ a b Nathan, Ian (January 2003). "The 100 DVDs You Must Own". Empire. p. 27. ^ a b c d E.T. — The Reunion (DVD). Universal, directed by Laurent Bouzereau. 2002. ^ Jamieson, Natalie (July 16, 2008). "The man who brings movies to life". Newsbeat. Archived from the original on April 4, 2012. Retrieved July 17, 2008. ^ a b David E. Williams (January 1983). "An Exceptional Encounter". American Cinematographer. pp. 34–7. ^ "The Worldwide Guide To Movie Locations". Movie-Locations.com. Archived from the original on February 9, 2015. ^ John Williams (2002). A Conversation with John Williams (DVD). Universal. ^ Newman, John (September 17, 2001). "Satyajit Ray Collection receives Packard grant and lecture endowment". University of California, Santa Cruz. Archived from the original on November 4, 2005. ^ "Ray influenced E.T says Martin Scorsese". The Times of India. May 19, 2010. Archived from the original on December 4, 2013. Retrieved December 4, 2013. ^ Rahman, Obaidur (22 May 2009). "Perceptions: Satyajit Ray and The Alien!". Star Weekend Magazine. 8 (70). Retrieved 2009-05-31. ^ "Close encounters with native E.T. finally real". The Times of India. April 5, 2003. Retrieved March 24, 2009. ^ "Satyajit Ray Collection Receives Packard Grant and Lecture Endowment". University of California Santa Cruz. 2001-09-17. Retrieved 2014-11-10. ^ Chhabra, Aseem (November 11, 2017). "The story of the similarities between Spielberg's E.T., and a Satyajit Ray script". The Hindu. Retrieved December 27, 2017. ^ "A federal appeals court Friday ruled against playwright Lisa..."
^ a b Crist, Judith (1984). "Take 22: Moviemakers on Moviemaking". Viking. ^ a b Taylor, Charles (March 22, 2002). "You can go home again". Salon. Archived from the original on August 2, 2008. Retrieved September 11, 2008. ^ Arnold, Gary (June 6, 1982). "E.T. Steven Spielberg's Joyful Excursion, Back to Childhood, Forward to the Unknown". The Washington Post. ^ a b Scott, A. O. (March 22, 2002). "Loss and Love, A Tale Retold". The New York Times. Archived from the original on June 21, 2008. Retrieved April 11, 2008. ^ Wuntch, Philip (July 19, 1985). "Return of E.T.". The Dallas Morning News. ^ Sheehan, Henry (May–June 1992). "The Panning of Steven Spielberg". Film Comment. Archived from the original on July 3, 2007. Retrieved July 16, 2007. ^ Kauffmann, Stanley (July 27, 1982). "The Gospel According to St. Steven". The New Republic. ^ Anton Karl Kozlovic. "The Structural Characteristics of the Cinematic Christ-figure," Archived February 23, 2005, at the Wayback Machine Journal of Religion and Popular Culture 8 (Fall 2004). ^ a b Ebert, Roger (August 9, 1985). "E.T. : The Second Coming". Movieline. ^ "Festival de Cannes: E.T. the Extra-Terrestrial". festival-cannes.com. Archived from the original on January 3, 2014. Retrieved June 13, 2009. ^ "E.T. : The Extra-Terrestrial — Weekend Box Office". Box Office Mojo. Archived from the original on September 21, 2013. Retrieved April 18, 2007. ^ Dirks, Tim. "Top Films of All-Time: Part 1 – Box-Office Blockbusters". Filmsite.org. Archived from the original on October 14, 2013. Retrieved March 4, 2012. ^ Wuntch, Philip (July 19, 1985). "Return of E.T." The Dallas Morning News. Retrieved March 6, 2012. ^ "E.T. :The Extra-Terrestrial (1982)". Box Office Mojo. Archived from the original on August 4, 2016. Retrieved May 31, 2016. ^ "Spielberg's Creativity". The New York Times. December 25, 1982. Archived from the original on June 5, 2009. Retrieved April 17, 2010. ^ a b Callo, Jim (August 23, 1982). "Director Steven Spielberg Takes the Wraps Off E.T., Revealing His Secrets at Last". People. ^ "Yours Free From E.T. With Membership". Ahoy! (advertisement). January 1984. p. 91. Archived from the original on March 16, 2016. Retrieved June 27, 2014. ^ "E.T. : The Extra-Terrestrial (Re-issue)". Box Office Mojo. Archived from the original on May 30, 2013. Retrieved March 6, 2012. ^ a b "E.T. (20th Anniversary)". Box Office Mojo. Archived from the original on March 5, 2012. Retrieved March 6, 2012. ^ "Jurassic Park (1993) – Miscellaneous notes". Turner Classic Movies. Archived from the original on October 2, 2013. Retrieved November 20, 2014. ^ Dirks, Tim. "Greatest Movie Series Franchises of All Time: The Star Wars Trilogy – Part IV". Filmsite.org. Archived from the original on October 3, 2013. Retrieved March 4, 2012. ^ Griffin, Nancy (June 1988). "Indiana Jones and the Last Crusade". Premiere. ^ CERONE, DANIEL (November 27, 1991). "'E.T.' . . . Call Sears : Giant Retailer Uses Giant Film to Ring in Holiday Ratings, Shoppers". Los Angeles Times. ISSN 0458-3035. Archived from the original on August 29, 2016. Retrieved September 8, 2016. ^ "'E.T. the EXTRA-TERRESTRIAL' RETURNS; MULTI-MILLION DOLLAR CROSS PROMOTION WITH PILLSBURY ANNOUNCED". PR Newswire via the Free Online Library. Retrieved 2016-09-14. ^ Hall, Sheldon (2010). Epics, Spectacles, and Blockbusters: A Hollywood History. Wayne State University Press. p. 238. ISBN 0814336973. ^ "VCR: a boon for the bargain hunter". United Press International. October 24, 1988. ^ "Batman' sets video rental record". United Press International. December 13, 1989. ^ "ET: The Extra-Terrestrial (1982) - Financial Information". The Numbers. Retrieved June 10, 2018. ^ "50 Most Magical Movie Moments". Empire. January 2004. p. 127. "ET's bike flight 'cinema's most magical moment'". Archived from the original on February 2, 2014. Retrieved May 17, 2012. ^ "6 Iconic Scenes Ripped Off From Lesser-Known Movies". Cracked. Archived from the original on July 11, 2016. ^ Ebert, Roger. "E.T. The Extra Terrestrial (2002)". RogerEbert.com. Archived from the original on January 29, 2016. Retrieved February 9, 2016. ^ Sragow, Michael (July 8, 1982). "Extra-Terrestrial Perception". Rolling Stone. ^ Malcolm, Derek (December 9, 1982). "Raiders of the Ugly Duckling". The Guardian. Archived from the original on August 25, 2016. Retrieved July 17, 2016. ^ Maltin, Leonard. "100 Must-See Films of the 20th Century". AMC Filmsite. Archived from the original on October 15, 2013. ^ Will, George (July 19, 1982). "Well, I Don't Love You, E.T.". Newsweek. ^ "E.T. The Extra-Terrestrial (1982)". Rotten Tomatoes. Fandango Media. Archived from the original on December 23, 2013. Retrieved March 20, 2018. ^ "E.T. the Extra-Terrestrial (re-release) Reviews". Metacritic. CBS Interactive. Archived from the original on October 28, 2013. Retrieved October 16, 2008. ^ "U.N. Finds E.T. O.K.". The Twilight Zone Magazine. February 1983. ^ McClintock, Pamela (August 19, 2011). "Why CinemaScore Matters for Box Office". The Hollywood Reporter. Archived from the original on May 10, 2014. Retrieved September 14, 2016. ^ "The 55th Academy Awards (1983) Nominees and Winners". Academy of Motion Picture Arts and Sciences. Archived from the original on September 5, 2012. Retrieved October 9, 2011. ^ "E.T. Awards". AllMovie. Archived from the original on March 21, 2009. Retrieved April 17, 2010. ^ "Awards for E.T. the Extra-Terrestrial (1982)". Internet Movie Database. Archived from the original on March 3, 2013. Retrieved May 12, 2007. ^ "America's Most Heart-Pounding Movies". American Film Institute. Archived from the original on December 25, 2013. Retrieved April 4, 2007. ^ "America's Most Uplifting Movies". American Film Institute. Archived from the original on March 8, 2016. Retrieved April 4, 2007. ^ "AFI's 100 Years of Film Scores". American Film Institute. Archived from the original on December 25, 2013. Retrieved April 4, 2007. ^ "AFI Crowns Top 10 Films in 10 Classic Genres". American Film Institute. June 17, 2008. Archived from the original on October 12, 2013. Retrieved June 18, 2008. ^ "AFI's 100 Years...100 Movie Quotes". American Film Institute. Archived from the original on February 10, 2007. Retrieved February 15, 2007. ^ "The 100 Greatest Movie Lines". Premiere. Archived from the original on December 13, 2007. Retrieved April 26, 2007. ^ "100 Greatest Family Films". Channel 4. Archived from the original on June 24, 2008. Retrieved April 17, 2010. ^ Corliss, Richard (February 12, 2005). "E.T. The Extra-Terrestrial (1982)". Time. Archived from the original on August 31, 2011. Retrieved April 17, 2010. ^ "#8 E.T. The Extra-Terrestrial". Entertainment Weekly. November 19, 2003. Archived from the original on January 8, 2014. Retrieved May 11, 2007. ^ Kirschling, Gregory (May 7, 2007). "The Sci-Fi 25". Entertainment Weekly. Archived from the original on May 8, 2007. Retrieved May 7, 2007. ^ Moran, Michael (October 5, 2007). "The 40 most memorable aliens". The Times. London. Archived from the original on October 4, 2011. Retrieved October 8, 2007. ^ "Films Selected to The National Film Registry, Library of Congress 1989–2006". National Film Registry of the Library of Congress. Archived from the original on May 1, 2008. Retrieved February 15, 2007. ^ News, ABC. "Best in Film". Archived from the original on June 3, 2015. ^ "E.T. Immortalized In Wax Around The World". Associated Press. Archived from the original on February 2, 2014. Retrieved October 22, 2012. ^ Live at the Shrine! John Williams and the premiere of E.T. the Extra-Terrestrial (DVD). Universal. 2002. ^ Travers, Peter (March 14, 2002). "E.T. The Extra-Terrestrial". Rolling Stone. Archived from the original on January 14, 2009. Retrieved May 12, 2007. ^ Hewitt, Chris. "E.T. The Extra-Terrestrial: 20th Anniversary Special Edition". Empire. Archived from the original on June 19, 2013. Retrieved May 12, 2007. ^ Trey Parker, Matt Stone (2002-07-10). "Free Hat". South Park. Season 6. Episode 88. Comedy Central. ^ "How Does Spielberg Feel About Going Back and Changing Movies". YouTube. Archived from the original on October 22, 2013. Retrieved August 2, 2012. ^ Schuchardt, Richard (October 24, 2002). "E.T. – The 3 Disc Edition". DVD Active. Archived from the original on December 8, 2012. Retrieved May 12, 2007. ^ Quint (aka Eric Vespe) (June 3, 2011). "Spielberg Speaks! Jaws Blu-Ray in the Works with No 'Digital Corrections!". Ain't It Cool News. Archived from the original on October 24, 2013. Retrieved June 9, 2011. ^ Madigan, Nick (December 28, 1998). "E.T. to drive home safe road message". Variety. Archived from the original on August 23, 2007. Retrieved November 26, 2006. ^ "ET phones home again". BBC News. April 8, 1999. Archived from the original on February 2, 2014. Retrieved April 17, 2010. ^ Bloom, David (June 13, 1999). "Calling the shots". Los Angeles Daily News. ^ "LEGO Dimensions Expansions Trailer: Harry Potter, Goonies, Gremlins & more". Slashfilm.com. June 9, 2016. Archived from the original on November 22, 2016. Retrieved November 22, 2016. ^ "LEGO Dimensions Adds Fantastic Beasts, Adventue Time, Gremlins, Sonic & ET". Cosmic Book News. Archived from the original on November 22, 2016. Retrieved November 22, 2016. ^ Wampler, Scott (April 13, 2015). "The Incredibly Ill-Advised E.T. Sequel That Almost Was". Birth.Movies.Death. Archived from the original on November 8, 2016. Retrieved November 8, 2016. ^ John M. Wilson (June 16, 1985). "E.T. Returns to Test His Midas Touch". Los Angeles Times. p. T22. ^ "A look at the E.T. sequel we mercifully never saw". Blastr. Archived from the original on November 8, 2016. Retrieved November 8, 2016. Wikimedia Commons has media related to E.T. the Extra-Terrestrial.